The data come from surveys carried out by the Ministry of National Education, Higher Education and Research (MENESR) in the Sub-department of Information systems and Statistical studies (SIES), firstly on businesses (private or public) and secondly on government departments. The business survey was conducted on around 11,000 businesses performing R&D in French territory. The survey was exhaustive for businesses with domestic expenditure on R&D of more than €0.4m and sampled for the others. Several methodological changes were made to the survey of institutions that fall within the ‘government’ institutional sector in 2010. As a result, R&D carried out by government departments and certain dedicated State research institutions was assessed using a new method that made it possible to distinguish their funding activities more effectively. This resulted in the estimate for GOVERD being revised downwards by around €1 billion (including €850 million for Defence). The five institutional sectors used for the purposes of international statistics are: government (including defence), higher education, private non-profit, business enterprise (State-owned and private) and abroad (including international organisations). The ‘government’, ‘higher education’ and ‘private non-profit’ sectors all fall under the heading of ‘government’ or ‘public sector’. This sector also includes EPSTs, EPICs, public administrative bodies (EPA) and government departments (including Defence). The ‘higher education’ institutional sector is made up of higher education institutions (universities and Grandes Écoles), university hospitals and French Comprehensive Cancer Centres (CLCC). The CNRS is deemed to be part of the higher education sector for the purposes of comparing France with other countries. Within the ‘business enterprise’ institutional sector, GERD is broken down into one or more economic activity branches that benefit from R&D. These 32 branches are taken from the 2008 version of the French classification of activities (NAF rev.2). In 2014, half of intramural business expenditure on R&D (BERD) was focused on six industrial branches (‘Manufacture of motor vehicles’, ‘Manufacture of air and spacecraft and related machinery’, ‘Manufacture of basic pharmaceutical products and pharmaceutical preparations’, ‘Computer-related and information service activities’, ‘Professional, scientific and technical activities’ and ‘Manufacture of chemicals and chemical products’). In the public sector, dedicated research institutions (EPST and EPIC) carried out 54% of all R&D funded by intramural government expenditure (GOVERD). In 2014, intramural business expenditure on research and development (BERD) totalled €31.1 billion, while government expenditure (GOVERD) was €16.8 billion. GERD increased by 0.6% in volume compared to the previous year, reflecting an increase in business research and development (BERD) spending (+1.2%), but is moderated by a decrease gf government spending (-0.4%) (table 27.01). By 2015, growth in GERD could reach +0.9% in volume, thanks to a continuation of the pace of growth in business spending, accompanied by a slight increase in those of the administrations. The breakdown of BERD among the main fields of research reveals a marked concentration (table 27.02). Six of the 32 research areas receive half of France’s R&D resources: ‘manufacture of motor vehicles’ (14% of BERD); ‘manufacture of air and spacecraft and related machinery’ (11%); ‘manufacture of basic pharmaceutical products and pharmaceutical preparations’ (10%); ‘specialised scientific and technical activities’ and ‘computer-related and information service activities’, each 7%; and ‘manufacture of chemicals and chemical products’ (6%). Since 2007, the ‘manufacture of motor vehicles’ field has become more dominant, primarily to the detriment of ‘manufacture of air and spacecraft and related machinery’. In 2015, it recorded the same level of expenditure as in 2008. 'Manufacture of air and spacecraft and related machinery’ has been very dynamic since 2011. By contrast, expenditure on the pharmaceutical industry has fallen since 2008. Taken as a whole, research fields within the service sector received 21% of BERD (€6.6 billion). In the past 3 years, R&D expenditure within the service sector has shown significant growth, increasing by 5.9% a year on average in real terms, in comparison to a growth of 0.7% in volume per year for the manufacturing industries. For the 'primary, energy, construction' sector, the average annual development of +1.6% is double that for the industrial manufacturing sector. In 2014, 65.0% of businesses in France carried out R&D, placing France ahead of the United Kingdom (64.4%) but far behind South Korea (78.2%), Japan (77.8%), the United States (70.6%) and Germany (67.5%) (chart 27.03). However, it should be noted when making comparisons with other countries that R&D by French businesses does not cover the country’s entire technological and industrial field. A considerable proportion of high-level technological R&D is carried out by dedicated State research institutions and foundations. Public research is carried out by dedicated research institutions (accounting for 54% of GOVERD in 2014), higher education institutions (40%), the private non-profit sector (4%) and government departments and other State institutions (1%) (chart 27.04). In 2014, State-owned scientific and technological establishments (EPST), of which there are eight, carried out 32% of government-funded R&D. They varied widely in size, from the multidisciplinary National Centre for Scientific Research (CNRS), which conducted 19% of government-funded R&D, to the French National Institute for Agricultural Research (INRA) and the French National Institute of Health and Medical Research (INSERM), both of which accounted for 5% of GOVERD. State-owned industrial and commercial establishments (EPIC), of which there are twelve, were responsible for 22% of government-funded R&D. R&D was also highly concentrated among EPICs, with 14% of GOVERD going to the civil division of the French Alternative Energies and Atomic Energy Commission (CEA) and 3% to the French Government Space Agency (CNES), with the remaining EPICs accounting for 5% of GOVERD. Between 2013 and 2014, GERD fell in real terms among EPICs (-2.1%), in the National Centre for Scientific Research (CNRS) (-0.9%) and in higher education institutions (-0.1%). However, R&D expenditure increased in real terms in the other EPSTs (+0.4%), and in the not-for-profit sector (+5.3%). Extract from the chapter "27. gross domestic expenditure on research and development". 1 Evaluated on the basis of the price change for GDP as revised in 2014 (base year = 2010). 2 Government, higher education and the non-profit sector. 1 Since 2008, the branches that benefit from R&D have been defined using the second edition of the French classification of activities (NAF Rev. 2). 1 Government, higher education and the private-non-profit sector. 2 Excluding (all or part of) capital expenditure. 3 Excluding (all or most) defence. En 2014, la dépense intérieure de recherche et développement (DIRD) s’établit à 47,9 milliards d’euros (Md€), en hausse de 0,6 % en volume par rapport à 2013. 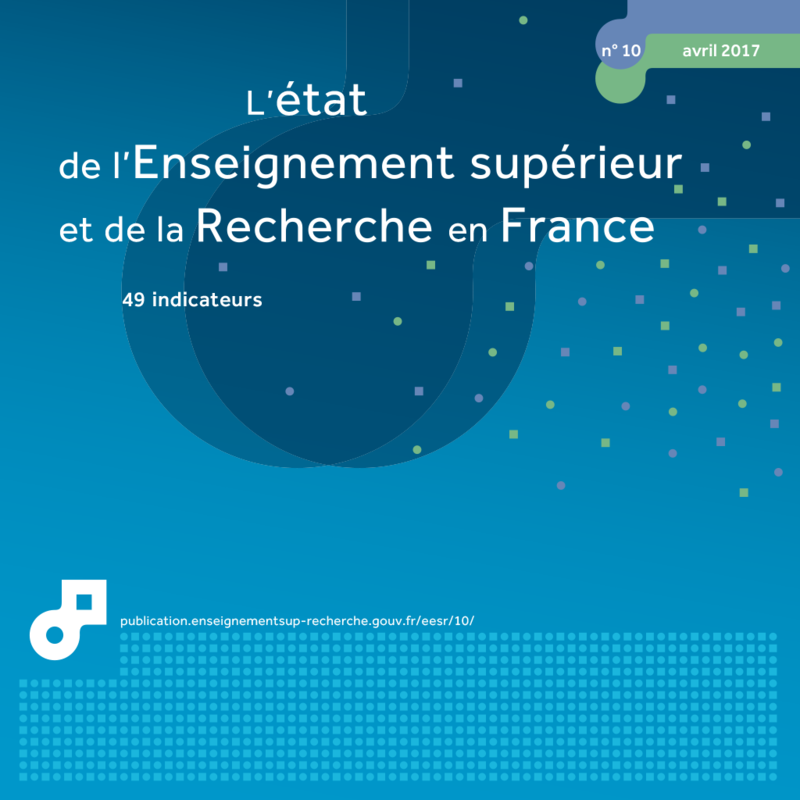 L’augmentation de la DIRD résulte de la progression des dépenses de recherche et développement (R&D) des entreprises (+ 1,2 %), mais est modérée par une légère diminution des dépenses des administrations (- 0,4 %). Les activités de R&D dans les entreprises et les administrations mobilisent 417 200 personnes, en équivalent temps plein. L’effort de recherche de la nation, mesuré en rapportant la DIRD au produit intérieur brut (PIB), se maintient à 2,24 % en 2014. Il pourrait légèrement diminuer en 2015, pour atteindre 2,23 %. En effet, l’évolution de la DIRD devrait accélérer (+ 0,9 % en volume, estimation) grâce à la progression de la DIRD des entreprises et des administrations, mais moins rapidement que le PIB (+ 1,3 %).